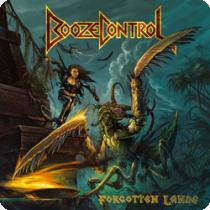 “Forgotten Lands,” as the title track comes roaring into life and delivers something of great promise. Harmonies galore, a shredding intro solo, it’s all there. “Attack Of The Axemen,” is slower, more deliberate, and definitely a lot more heavy than the title track, but it contains similar elements, and is just as much a classic. “The Nameless,” is all power and bass, and something truly solid. “Of The Deep,” weaving chaos and woe into a solid riff and melody structure. “Spellbound,” a rip roaring, snorter of a song, bringing with it something new and interesting and fascinating. “Slaying Mantis,” weaves a tale within and without. A frenetic riff, a barnstorming chorus and some truly awesome bass work. “Playing With Fire,” Iron Maiden come again, truly intricate. “Thanatos,” harmony galore, and a pounding riff lead the way. “Doom Of Sargoth,” a rip roaring, pace building galloping song that leads the charge. “Cydonian Sands,” the last song on the record and the longest and most epic. Weaving within and without, taking the time to build the story and ensure the narrative continues.